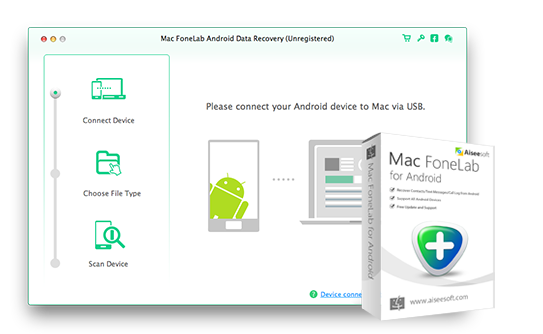 Mac FoneLab Android Data Recovery is the best Android data recovery app for recovering deleted/lost data including photos, messages, contacts, videos, music, etc from Android phones/tablets/SD card on Mac. As a professional Android data recovery software, it supports all popular Android phones like Samsung, Sony, HTC, and tablets. It offers free trial version for you to download. Meanwhile, this software assures you a 100% safe and clean environment.Key Features:1. Recover lost contacts, call logs, messages and message attachmentsMac FoneLab Android Data Recovery enables you to restore lost contacts. Moreover, it helps you to get back call logs when you do not save the contact information of a new friend. It can also help you recover messages with important friends and message attachments in messages.2. Recover photos, music and videosAndroid Data Recovery for Mac can help you get back precious media files including photos, videos, and audio files.3. Get back documents of word, excel, PPT, PDF and HTML, etc.Some users would like to save important documents on their Android devices. When these files get lost, you can use this software to recover deleted files on Mac.4. Support all popular Android devicesIt supports a wide range of Android brands including Samsung, LG, HTC, Sony, Motorola, Huawei, ZTE and more. Besides, it supports all current Android operating systems from Android 2.3 to 6.0.5. Easy to use and friendly to useMac FoneLab Android Data Recovery software is easy to use. It enables you to recover Android data with jsut several clicks. It has further simplified the interface, so you can use it smoothly even with little computer knowledge.6. 100% safe and cleanThis software recovers data from Android phones, tablets and SD card on Mac in a non-virus environment and guaranties no privacy disclosure. So just feel safe to use this awesome program to help you retrieve your deleted or lost files. EZ Backup Thunderbird Premium makes it easy to backup your Thunderbird mail, address book and settings to a local drive, network folder, CD/DVD and even to a remote FTP server!